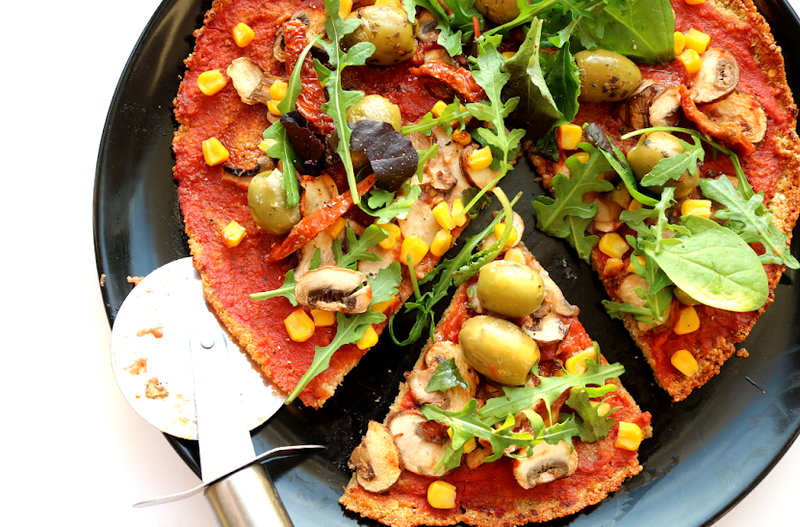 Maintaining a healthy gut is one of the best ways to stay healthy, but it's not always easy to stay on top of everything when you have a busy lifestyle, and your diet is often one of the key areas that suffers as a result. 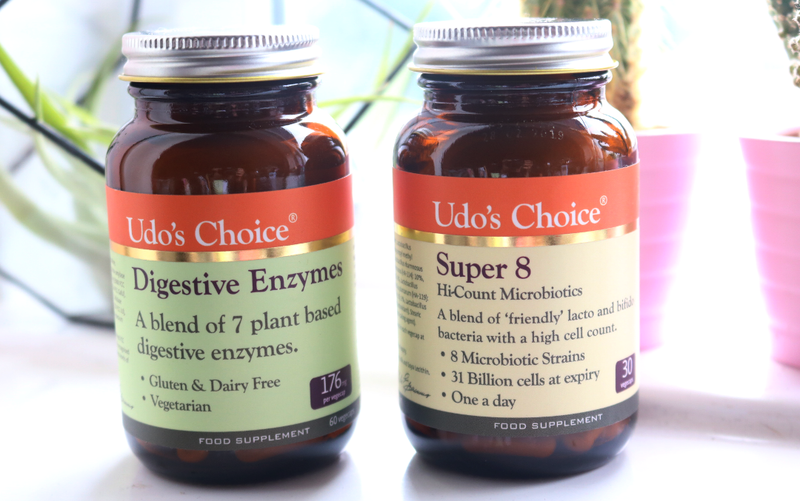 Luckily, help is on hand from Udo's Choice and I've been trying out their popular Digestive Enzymes and Super 8 supplements for the past month. The benefits of having a healthy gut and looking after your digestive system have become much more apparent in the West during recent years, although places like India have had a focus on its importance for a long time (Ayurveda is one such example), and many other Eastern cultures have an emphasis on gut health in their traditional medicine approaches. But why is a healthy gut important? In a simplified nutshell, the gut is where billions of friendly bacteria and microbes live, and they help to keep your digestive system working as it should be. They also help with things like obesity and weight management and have links to supporting your immune system as well, plus there's a lot of research being carried out to assess the gut's impact on many other bodily functions. The gut may even play a role in problems like depression and poor mental health, as it's often referred to as the 'second brain', with research suggesting that gut bacteria likely influences our behaviour and moods. It's a fascinating subject! What Can I Do to Keep My Gut Healthy? Eating the right food is the best way to keep your gut happy and healthy, and feeding the 'good bacteria' in your gut is one of the easiest and most effective methods, as it will help them to thrive and multiply, so you can maintain a healthy level of them at all times. In your daily diet, try to include a range of wholefoods and plant-based foods and vary these up throughout the week - there are lots of different types of microbes in your gut and like people, they like to eat different foods! Make sure there's lots of fibre, good fats like olive oil, and probiotics like yoghurts and fermented foods too. Although they can be tasty, try to reduce your intake of highly processed foods as they usually have ingredients that 'upset' the balance of the good bacteria and increase the levels of 'bad bacteria', which can cause digestion problems. Whilst supplements can never be a substitute for a healthy and varied diet alongside an active lifestyle, they can be beneficial to those who need an extra helping hand. I take a range of supplements from various brands for different things, and I believe they can definitely help to make you feel your best during those times when everything's a bit too busy and stressful. 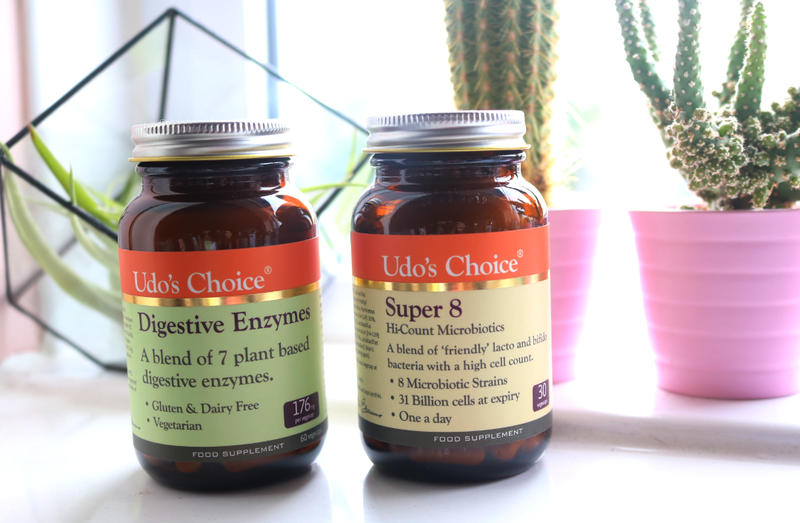 I've been curious to try more from Udo's Choice as I've been taking their Ultimate Oil Blend on and off for years (read my previous review here), so I decided to try out two of their popular healthy gut targeted supplements over the past month; the Digestive Enzymes and Super 8. Utilising a blend of 7 plant-based enzymes, these Digestive Enzymes come in vegetarian-friendly capsules and are gluten and dairy-free. They help to assist in the breakdown of fats, carbohydrates, soluble fibre, starch, milk sugar and complex sugars, which leads to better digestion and allows for the body to absorb the optimal amount of nutrients that it can from the food that you eat. Enzymes are essential for the body to function properly, yet are easily depleted when we're stressed, ill, pregnant or consuming too much alcohol and caffeine. Our bodies also naturally produce fewer enzymes as we get older, so these supplements are a really good way to keep your stash of enzymes topped up. These are very easy to take as you simply take one capsule before a meal and you can take an extra one if you're going to be eating a particularly heavy or fatty meal. 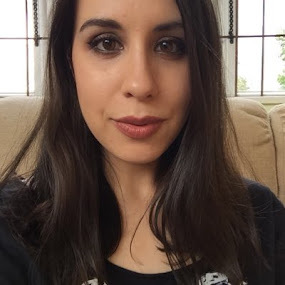 I didn't see a change immediately but after a week of daily usage, I began to notice that I was much less bloated after eating and that I felt more satisfied and full afterwards which I thought was a very positive result. 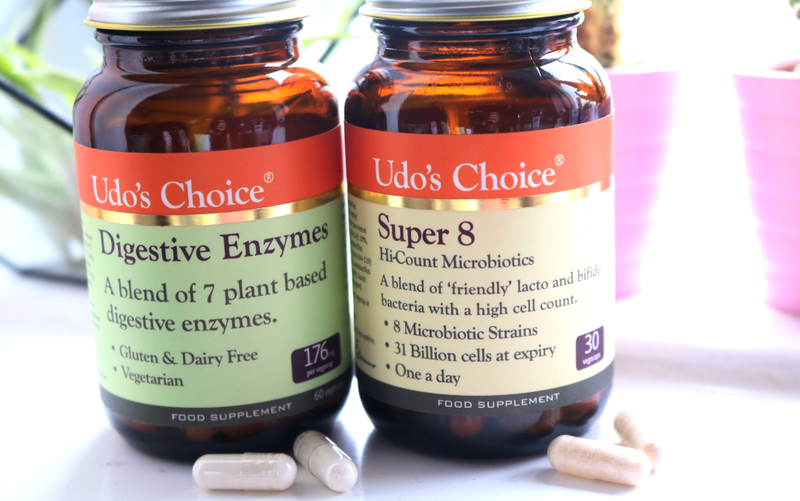 For those looking for a well-rounded gut support supplement, Udo's Super 8 is definitely worth a try. It's a specialist microbiotics supplement which helps to replenish the gut's stock of 'good' bacteria that I mentioned earlier, as it contains eight different bacteria strains which are found in both the small and large intestines; lacto in the small and bifido in the large, so all bases for your digestive system are covered. It boasts a whopping 31 billion cells at expiry too! These capsules are suitable for vegetarians and like the Digestive Enzymes, it's recommended that you take one before meals, but these need to be stored in the fridge afterwards. 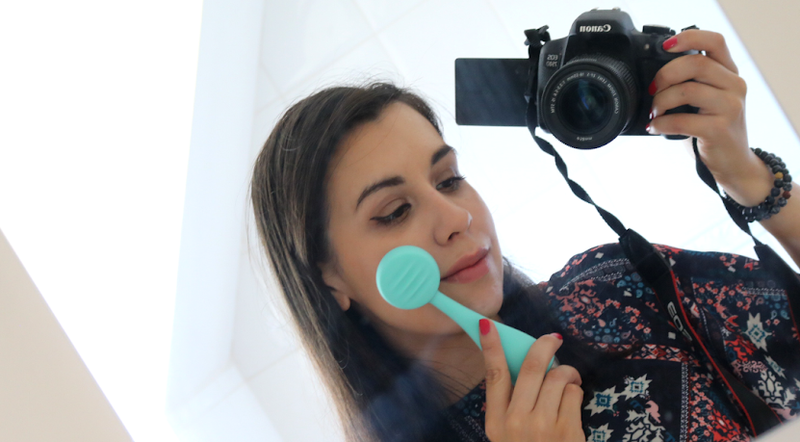 I wasn't quite sure what to expect, but after a fortnight of regular use, I did feel like my digestive system had improved somewhat and that I felt overall slightly happier in myself. 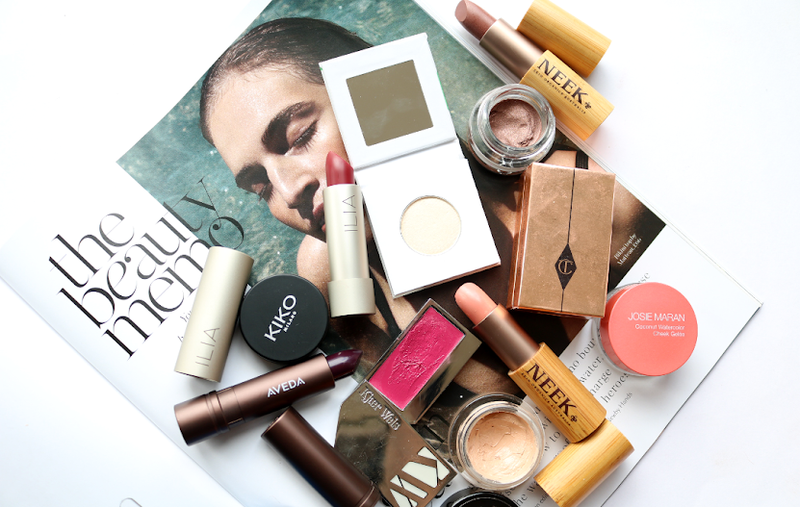 It's strange to experience a difference in mood like that and I'll definitely be continuing to use these in the coming months to see if more benefits occur. Do you take any supplements to support a Healthy Gut?